Fact: Peanut butter is the best thing that exists. When I was in Europe almost no one I talked to had tried peanut butter. The one person I talked to about peanut butter who had tried it thought it was really weird and not very good. For breakfast people would give me really good, delicious, fresh bread, but there would only be various jams or Nutella available to spread on it. I mean, jam and Nutella are good, but they’re not peanut butter. I tried Marmite once too while I was there, and I don’t even understand why that exists. 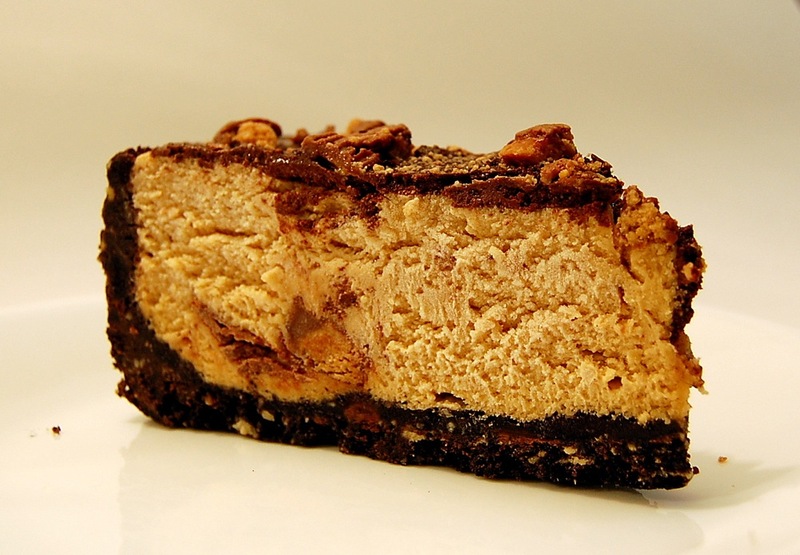 Anyways, this Reese’s peanut butter cheesecake recipe turnout out rich as hell, so I recommend serving rather thin slices. I mixed and matched this RecipeZaar cheesecake recipe right here with some tips from Bake or Break. Bake or Break actually has more gorgeous, drool-worthy photos on their Flickr stream. The recipe I linked to from RecipeZaar has more photos which show neat decorating ideas and other people’s tips/opinions on the recipe. In total I used about 15 Reese’s Peanut Butter Cups – 11 for the cheesecake filling, and 4 for sprinkling around the top. Another thing I noticed was that my crust seemed dry, so I added a bit more butter. The ingredients elsewhere on the web and here say “1/2 cup butter” but in total I used about 1/2 cup (1 stick) plus 2 more tablespoons. Maybe experiment for yourself…? If I were to do it all over again, I think I might also hold off on the chocolate topping and just go for more crushed Reese’s or Oreos or nuts on top of the cheesecake. That’s just me. I found the water bath thing a pain, but I had no cracks in my cheesecake and I didn’t get a bunch of water seeping in and ruining the cake or the Oreo crust, so I guess it was worth it. For the next cheesecake, I’d like to try just sticking a bath of water on a lower oven tray and seeing if that works. 1. Throw peanuts in a blender ’til they’re really small (not fine, but small). Combine the crushed Oreos and the ground peanuts with the stick of melted butter. Note: At this stage, I actually needed more butter because my crust seemed a bit dry. So about 1 stick + 2 tablespoons total. 2. Pat the crust mixture into 10-inch round springform pan. You should have enough to go up the sides. 3. Beat cream cheese until smooth. 4. Add eggs one at a time. Keep beating the eggs / cream cheese. 5. Add the sugar, the peanut butter and the whipping cream. Keep mixing. 6. Stir in the vanilla, and fold in the Peanut Butter Cups with a spatula. 7. Pour the filling into the prepared crust. 8. Cover the bottom of the springform pan with tin foil. You’re going to place it in water, so try and make it air tight. Place the springform pan into a larger baking pan, and fill the larger pan with hot water, such that the water comes about an inch up the sides of the springform pan. 9. Bake at 275 degrees F for 90 minutes, or until firm and lightly browned. Place it in the fridge. 10. Melt the chocolate and the sour cream in a microwave in 20 second bursts, stirring constantly. Once it’s all melted and smooth, spread it over the cheesecake with a spatula. Drop broken up Reese’s Peanut Butter Cups on top. Or add Oreos. Or a bunch of Snickers bars and peanuts. Really, the world is your oyster. Finally: Refrigerate the entire cake at least 4 hours. Then serve in extremely thin slices.